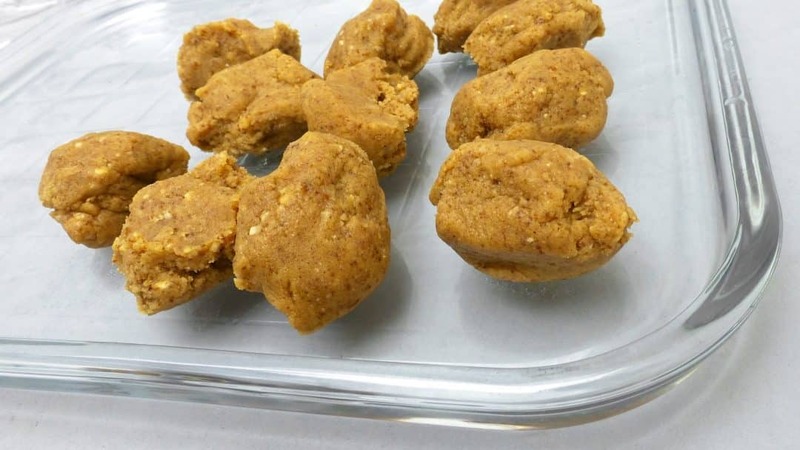 Eggless Hazelnut Cookies Recipe | Simple. Tasty. Good. Eggless cookies? I baked these eggless hazelnut cookies one afternoon when I had a sudden craving for cookies that would suit my right-after-lunch cup of coffee. But bugger, no eggs in my fridge! So there began my search for a delicious eggless bite. Hmmm let’s mix in that handful of hazelnuts I have still left after making a pumpkin roll… Bingo! Cup of coffee, a hazelnut cookie… Lovely! Watch my video of how to make eggless hazelnut cookies using my fabulous KitchenAid Stand Mixer Mini! Looking for more eggless treats? Then also check out my thumbprint cookies! 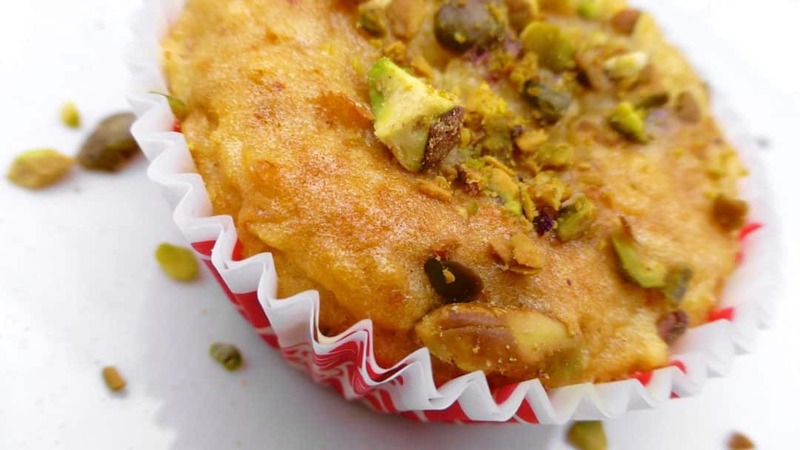 Or just scroll down to my eggless cupcake recipe on the bottom of this page! 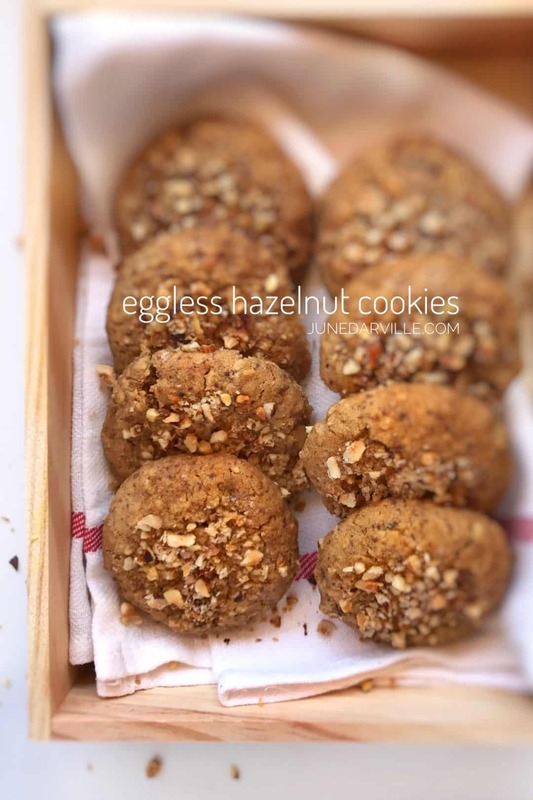 Check out my eggless hazelnut cookies! 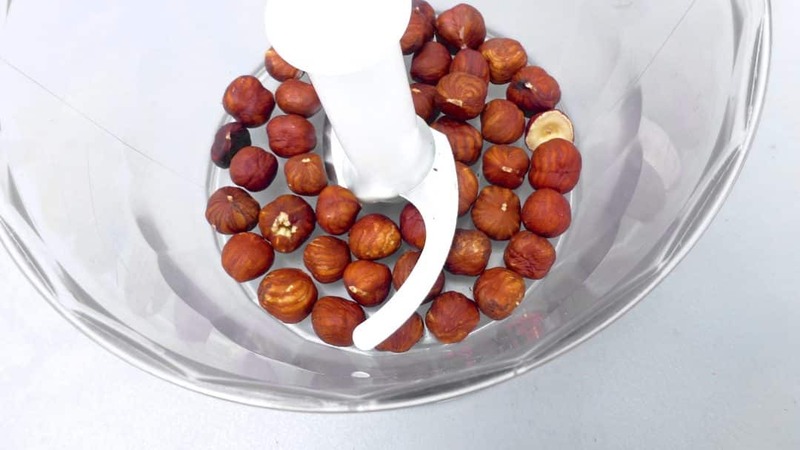 Add the hazelnuts to a blender. Pulse into a fine crumble. Keep 2 tablespoons of this crumble aside for garnish later. Then add the brown sugar. Pulse and add the diced cold butter also. Pulse into a coarse and sticky mixture. Add the plain flour and baking powder. Season with a little pinch of salt. Pulse again until the hazelnut cookie dough comes together. It shouldn't stick to your hands but only be wet and smooth. 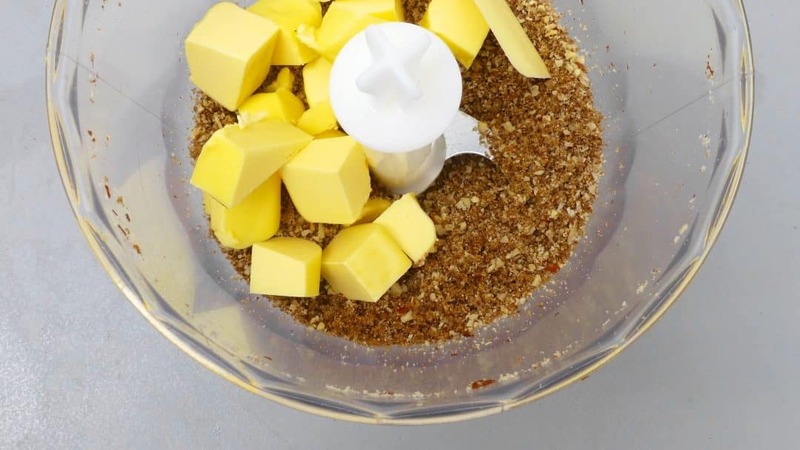 Remove it from the blender (no need to knead it) and divide the dough up into even pieces. I ended up making 12 cookies. 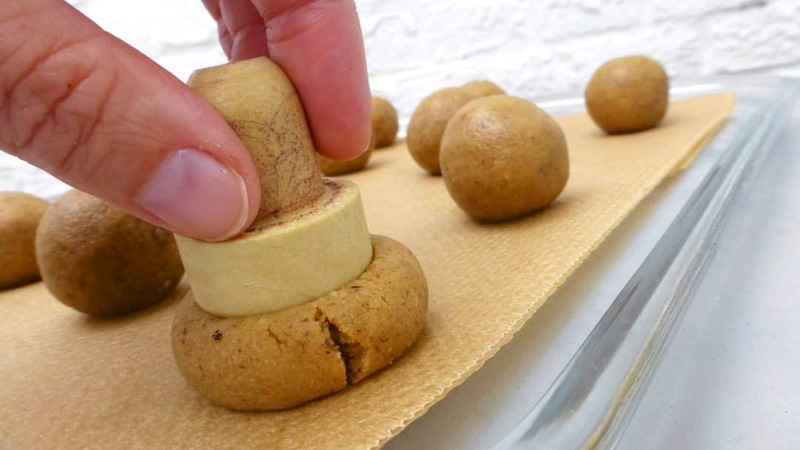 Roll the dough into small balls and put them on a baking tray lined with a sheet of baking paper. Press them down a little using a spoon, fork, meat mallet (I used a cork). 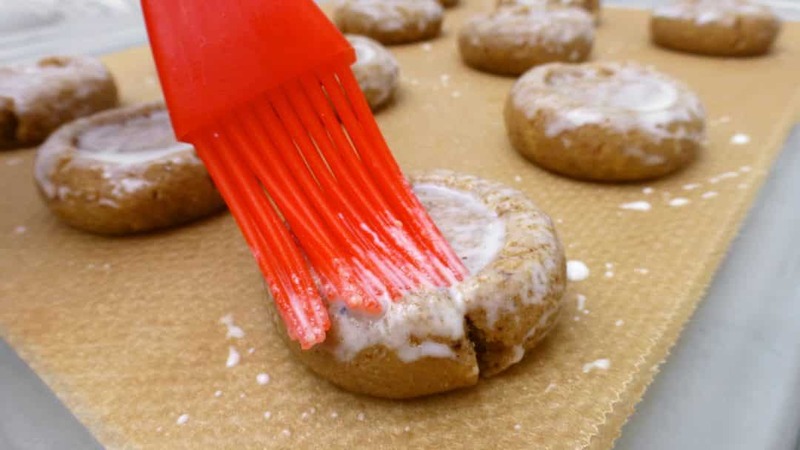 Now brush the top of the cookies with the milk. 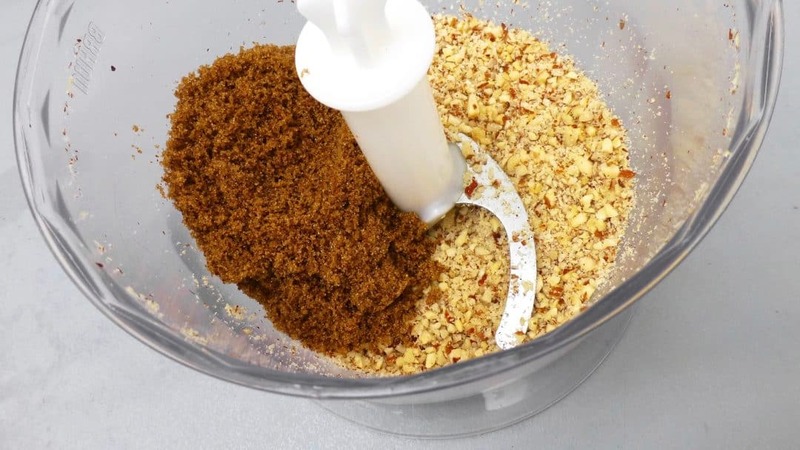 Sprinkle with the hazelnut crumble you put aside in the beginning of this recipe. Bake them in a preheated oven at 356°F (180°C) for 15 to 20 minutes until cooked through. Remove them from the hot oven and let the eggless hazelnut cookies cool down fully. 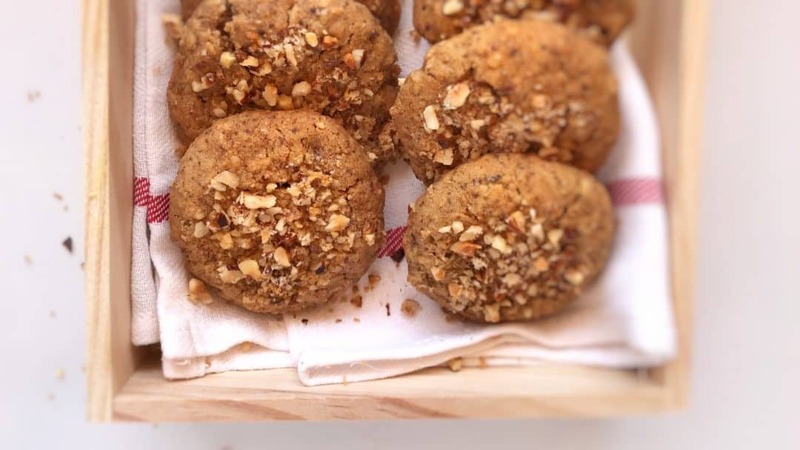 So here’s the full step by step recipe for how to make these eggless hazelnut cookies using the KitchenAid Stand Mixer! 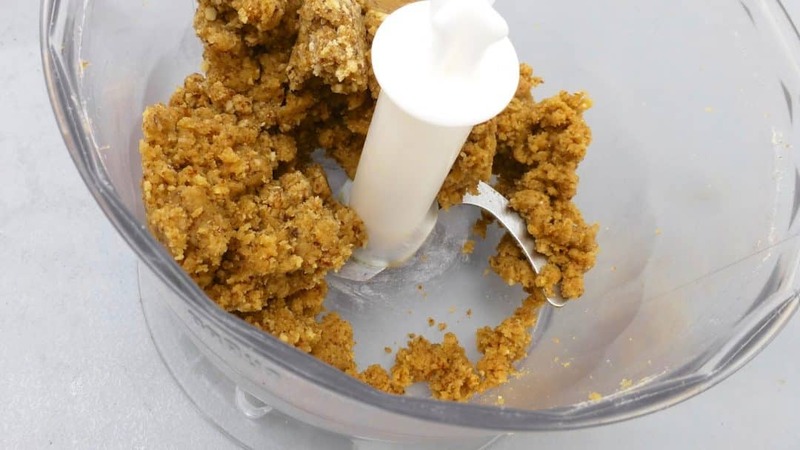 Pour the hazelnut crumble in the bowl of the Stand Mixer (keep 2 tablespoons of this crumble aside to garnish the cookies with later on). Then add the brown sugar and the diced ice cold unsalted butter. Attach the wire whip and lower the mixer head. Select Speed 4 and mix the ingredients for 3 minutes until smooth. Then add the sifted pastry flour and baking powder. Season to taste with a pinch of the coarse salt. Select Speed 2 and mix the ingredients for 3 more minutes until the hazelnut cookie dough comes together. It shouldn't be sticky but still be quite moist and smooth. Then tilt the mixer head back up and remove the dough from the bowl. You don't need to knead it. Divide the dough up into even pieces. 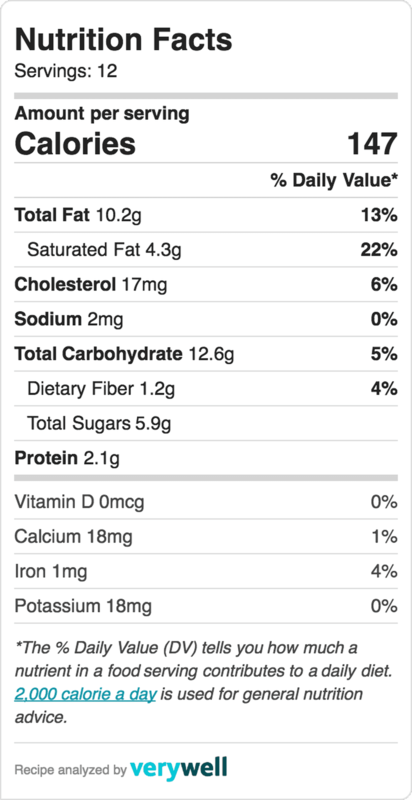 I ended up with a cookie dough weighing about 11 oz (330 g) which I divided into 11 even eggless hazelnut cookies. Roll the dough into small balls and then put them on a baking tray lined with a piece of baking paper. Press them down a little using a spoon, a fork or a meat mallet. I used a cork from a wine bottle. Now brush the top of the cookie dough with the milk. 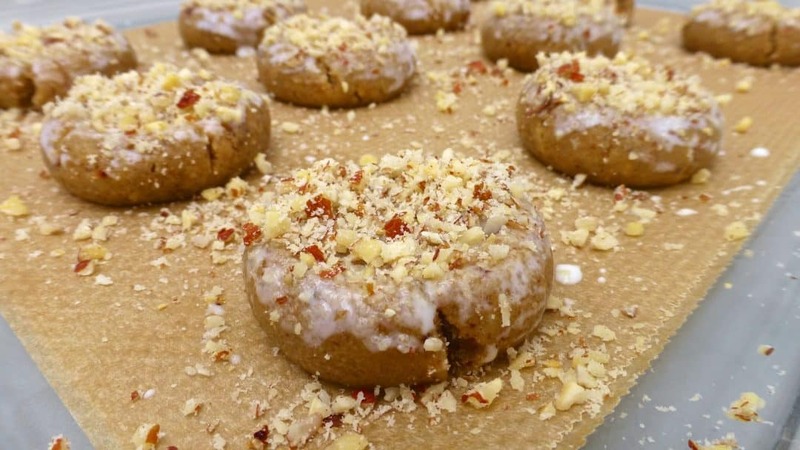 Then bake the hazelnut cookies in a preheated oven at 356°F (180°C) for 20 to 25 minutes or until cooked through. Remove the freshly baked cookies from the hot oven and let them rest on the baking tray until cool down fully. They will still be soft but crisp up once cold. Then serve the cookies or store them in a large jar in a cool pantry for up to 3 days. There’s a little difference in texture if you compare them to regular cupcakes, which is a little to be expected of course. Because of this these eggless cupcakes are a bit more solid looking, a little heavier maybe because there are no eggs in it but still extremely moist and pleasurable. There’s really not a lot more to it, they just need more time in the oven and that’s all. I pulled them out after 20 minutes to check on them (since I had never made those before) but then they were still uncooked in the middle. So I left them to bake for an extra half an hour which was enough. Wash the orange well. Then slice it up roughly and add the pieces to a clean blender, the orange peels included. Now blend the orange well into a fine puree. 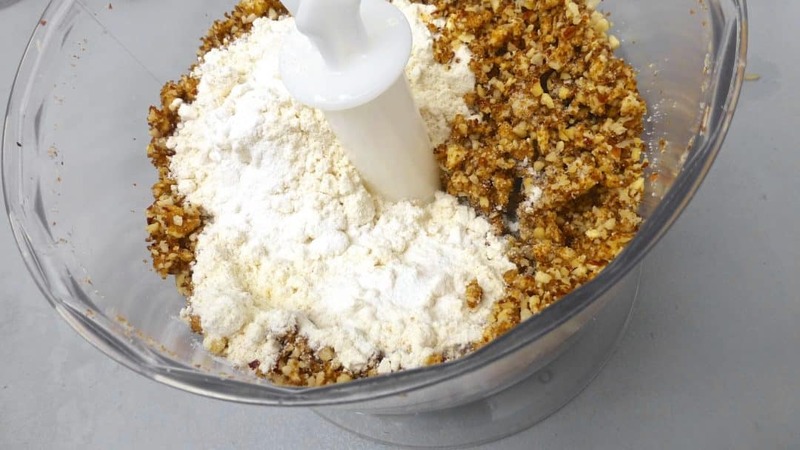 Sift the pastry flour, plain flour, baking soda and baking powder over a large mixing bowl and add the caster sugar. Mix well. Then add the orange puree and the melted butter. Season with a little pinch of salt. Then add the milk and half of the finely chopped pistachio nuts. Mix well to combine all the ingredients. You should end up with a pretty thick batter. Then carefully spoon the cupcake batter in a muffin pan lined with cupcake casings. Sprinkle with the rest of the chopped pistachio nuts. Bake the eggless cupcakes in a preheated oven at 356°F (180°C) for about 50 minutes until set in the middle. Then remove the cupcakes from the hot oven and let them cool down a little. Serve.